You feel like you are in the country while having restaurants and shopping just around the corner. This small house is for you who likes to relax when you are not walking in the streets of copenhagen. The landlord lives right next to the annex in his small house, so there will always be help to pick up. It can also be agreed that you can borrow two bicycles belonging to the place. 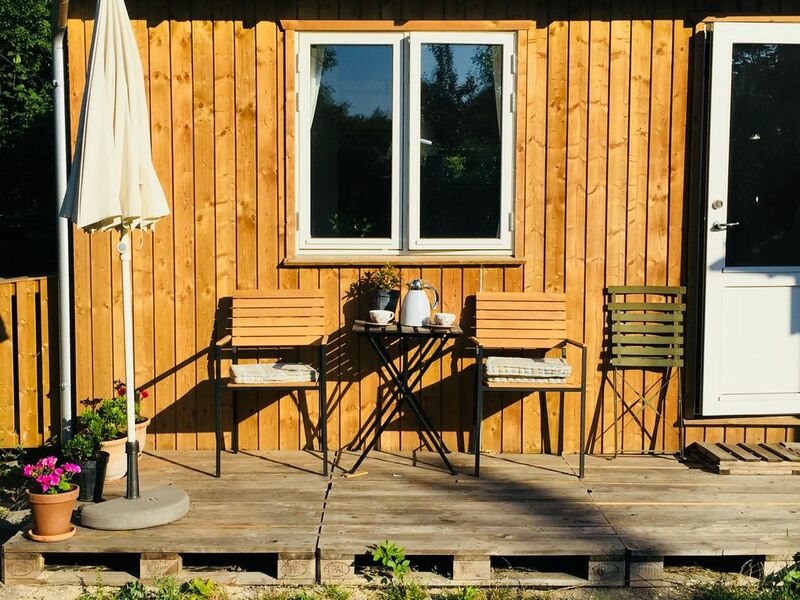 The annex consists of 1 large room with a small kitchenette just at the entrance and a living room area with dining table and comfortable sofa bed of 160 cm. In addition, there is a small loft with a 140 cm wide mattress with room for two people. The house is used as a music work room when it is not rented out so there is some equipment in the small notch as seen in the picture. In this one one ticks his suitcases so that they do not take up space in the rest of the house. Outside there is a small terrace with morning sun where you can drink your morning coffee. The house of 21 sqm seems much larger than it is because there is open to the chicken and the many windows b. L.a along one wall. The kitchen has everything you need, including a small refrigerator, but you cannot cook hot food as there is no cooker. Everything in the house is brand new which also includes the small bathroom with shower. NOTE..There is no shower cabinet so you bathe in front of the sink with shower curtain, see picture! There are blackout curtains in the house so you won't be awakened by the sun. The house is situated at the end of the living island pier where there is plenty of life throughout the summer through the waterfront, cafes and restaurants. The area is known for the harbor basin (Havneparken), which is one of the most popular areas along the kbh's waterfront. There are buses that can take you to the center, 500 meters from the house. It will take about 15 min to get to the center either by bus or by bike. You can also go for a walk to Christianshavn or Christiania long water and this will take 30 min on foot and 10 min by bike. The hipster smart Vesterbro is just across the water and fortunately there is a bridge that you can walk or ride on which will lead you dry. Ann was a great host and extremely helpful. The space was great and the location convenient. Thanks! We were able to get to Tivoli/Central station in less than 20min including walk and bus time. There is a grocery place 5min walk to the house, the bike path is just behind the house and there is also a brand new cafe that is quite nice. Loved the location, the vibe and the host! Thanks!!! Satisfactory and convenient for us. We were only in the home to sleep so it was fine. The area is interesting but hard for people to find. Good Value, Very comfortable and a little out of town location. Ann was great to communicate with and went out of her way to get us settled. Has everything needed to support exploring Copenhagen. Again it is out of town but close to a bus stop. The bus will take you to central station where you can get anywhere you would like to go. It is a little hard for the taxi drivers to find because of it's location and a lot of construction in the near area. A very good value. Ann was the kindest and most generous host I’ve ever stayed with. It was so handy having her right next door because she was right there with an answer to our questions or a small or big favour that we had during the week. Her Annex had everything we needed and showed us a whole new area of busy Copenhagen that we didn’t know existed. The Annex is also a short bus ride away from Copenhagen central bus and train station. Overall tremendous experience!! Thanks again Ann!! We loved our time in Ann's annex, Ann was the perfect host but we felt completely private too. The location is fantastic, right by the city but also close to nature and the river so it felt really peaceful and not at all hectic! We would definitely recommend staying here and would love to come again.